to the size of this room. 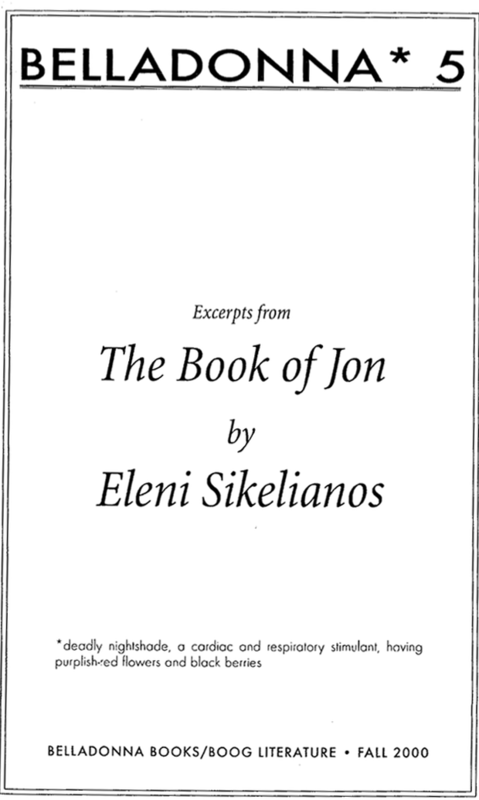 In her film-script/poem/memoir The Book of Jon, an excerpt of which Belladonna Books has put into one of their downloadable chaplets, Eleni Sikelianos has created a visual time stamp that retraces the lines of her father’s life and presence and records the impressions he has left on her. In the process, her commentary grows to include the way humans have left their stamp on the earth and thus lost track of the earth itself. In this selection, it may be easier for the reader than for the poet to tell where she ends and her father begins. She begins by addressing her father as “you,” in an epistolary fashion, then moves—removes—to the third person and refers to him as Jon in the section entitled “Notes Towards a Film About My Father (Jon).” This section is part script/part prose, but is broken by the slashes that normally indicate line breaks in poetry. Throughout this section, Sikelianos spotlights single shots, makes bracketed notes, and sets scenes apart to recreate her experience of her father. This is a form (or merging of forms) that Sikelianos develops even further in her book, You, Animal, Machine, a scrapbook-memoir-essay from Coffeehouse Press, about her grandmother Melena, who worked as burlesque dancer in the 1930s and ‘40s. Through these scenes of the larger world, Sikelianos—now more deliberately and confidently—flies parallel at 30,000 feet to the earlier father-daughter narrative. She seems to be commenting on the ways we are marked, the ways we mark each other and the world. Her final images call forth the desolations of privilege, once we remove ourselves from it to more plainly understand the impositions and superimpositions that we visit upon one another and our environments. Heather Brown received her MFA in poetry from Oregon State University. She lives and writes in Portland, Ore. and works for Powell’s Books, Inc.